Regular readers of this blog will know that I have previously covered some articles looking at the use of evolutionary debunking arguments in metaethics (see here and here, for examples). I must not have read the abstract closely enough before downloading this one since I was expecting Kahane to offer a more fulsome critique of the use of such arguments, but it turns out that wasn’t really what he was interested in. Nevertheless, the article is a good one and I thought I might share some of its details here. One thing I particularly liked about it was Kahane’s attempt to elucidate the general structure of such arguments and to show how they are used in normative and meta- ethics. In this first part, I’ll cover Kahane’s general analysis of debunking arguments. In the next part I'll consider their use in normative ethics. First things first, we need to be clear about the nature of a debunking argument (DA). Obviously, “debunking” is, in its everyday usage, intended to denote the practice of undermining or exposing some set of beliefs as being false. Given that this seems to be a common goal in philosophy, there could be many philosophically interesting DAs worth considering. For present purposes, the focus is on what might be called causal-DAs. 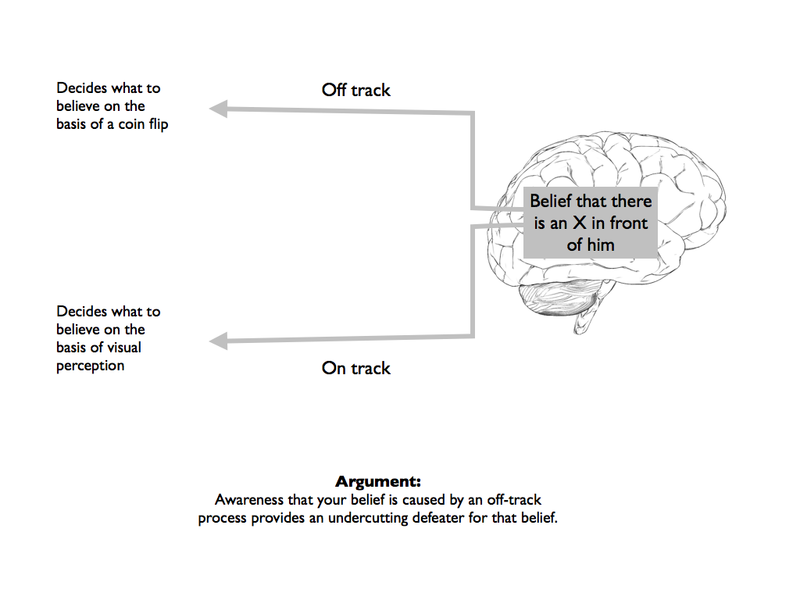 These are arguments that try to undermine some belief or set of beliefs by explaining its causal origins. Such arguments are, in fact, widespread. You probably use them all the time. To consider an obvious example, anyone who has studied Marxism will know that Marx seemed to think (or at least, can be interpreted as thinking) that offering a causal-historical explanation of an ideology could be an effective way of undermining that ideology. Now expressed in these terms such an argument is patently unsuccessful. It is an example of the genetic fallacy: Just because an ideology has a particular causal origin, does not mean that the ideology is false. But this in itself doesn’t mean that causal DAs are without merit. They just need to be reinterpreted in a more subtle way - as arguments that don’t undermine the truth of particular belief, but do undermine the justification (or warrant) that the believer might have for holding that particular belief. Here’s an example. Suppose Bob believes that there is a particular object (X) outside his house. Now suppose further that we learn that Bob has a rather peculiar process for determining what to believe is outside his house. Every morning he flips a coin, and if the coin comes up heads, he believes there is an X outside his house. Surely, such a causal explanation for a belief undermines the warrant or justification for holding that belief? Contrast this with an alternative causal explanation. According to this explanation Bob acquires the belief that X is in front of his house through visual perception of the object. Surely this causal explanation (assuming no additional defeaters) supports the justification or warrant for Bob’s belief? We can refer to the difference between these causal explanations in terms of processes that are “on track” (i.e. track the truth of whatever proposition is under consideration), and processes that are “off track” (i.e. don’t track the truth of whatever proposition is under consideration). This is illustrated below. Note that in the example given, the “off track” process is purely random. A more common variety of “off track” process might be one that is biased in a particular direction. 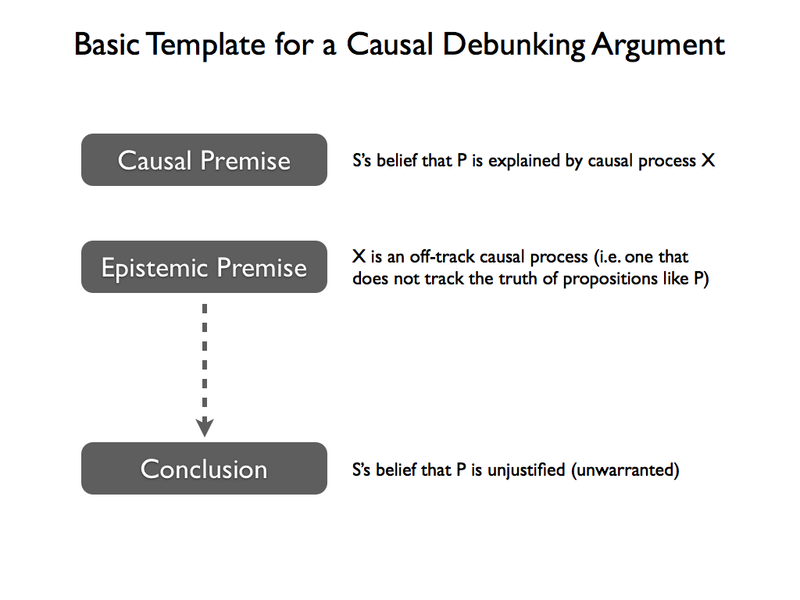 Causal Premise: S’s belief that P is caused by causal process X. Conclusion: The belief that P is unjustified (or unwarranted). As you can see, this is an argument that could work with any type of belief and any allegedly off track causal process. The concern in this article is to specifically examine arguments that focus on the evolutionary process and its implications for our evaluative beliefs. Causal Premise: S’s evaluative belief that P is caused by the process of evolution. Epistemic Premise: The process of evolution does not track the truth of evaluative propositions of type P.
Conclusion: S’s belief that P is unjustified, or unwarranted. Before we consider specific examples, there are three things to note about this style of argument. First, the causal premise refers to the process of evolution in general. It does refer to any specific mechanisms of evolutionary change. Although it is fair to say that most attention has been paid to adaptive explanations that appeal to the mechanism of natural selection, genetic drift or other processes could also be targeted. Second, the epistemic premise needs to be supported in a particular way. It must be shown that the off track process (in this case evolution) completely removes the influence of any potentially on-track processes. 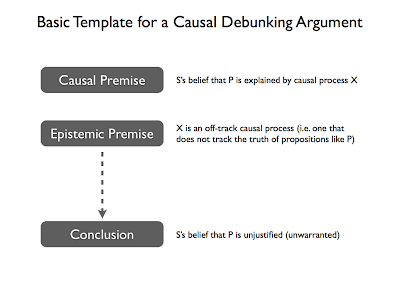 If there are on-track processes that also contribute to the causal explanation of the belief, then they might restore justification or, at the very least, not completely undermine it. Third, and this is one of Kahane’s key observations, the argument assumes that S is an ethical realist/objectivist. To be more precise, it assumes that S believes in mind-independent moral properties. Someone who believes that moral properties are constructed out of whatever evaluative attitudes we happen to have will be unpersuaded by this argument. Okay, that’s enough for now. In part two we’ll consider an example of an EDA drawn from the field of normative ethics. Be interested in your comments on Paul Griffiths' and my discussion of EDAs for religion and science: here. That's for pointing me in the direction of your article. I'll have a look at it over the next week or so. Post something after that. This may be a silly question, but what does an evaluative belief mean? Not sure that there is any "official" or widely agreed-upon definition, but I take it that an evaluative belief is simply a belief about what kinds of things (events, states of affairs etc) are valuable (or not valuable, as the case may be).